compact camcorder with accessories such as chargers and cables+ personal gear. 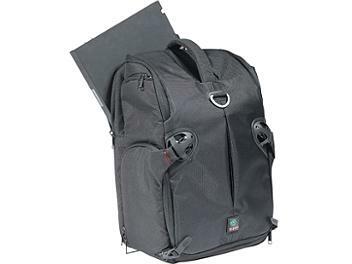 This unique bag provides ultimate freedom and allows for three carrying options in one while morphing from sling to backpack and back again. In sling position, the bag easily swings around from back to front to achieve quick draw access to your main camera and backup lenses as well as fast and easy changing of lenses. In backpack position and "X" position you can comfortably carry your equipment for long distances. Arrange your equipment in the bottom main compartment of the pack taking full advantage of the modular dividers to custom fit the bag to your exact equipment. The large top compartment will hold personal gear or additional gear, and the internal pockets and mp3 player pouch will allow you to organize your personal effects as efficiently as your photographic gear. Two external pockets allow quick zippered access to accessories without opening the main compartments. The included rain cover folds neatly away into an integrated pocket and can be hung out to dry on the small buckle next to the handle, or tucked away for storage in one of the pockets. The sling backpack is also compatible with the Kata insertrolley (not included) when easy, wheel along transportation is needed.